The heat was on after round 2, ask Gary Ablett, Nathan Buckley, Rodney Eade and the umpires to name but a few. Retired umpires took to the airwaves and the written press to urge people to take a deep breath. The media has taken a sledge hammer to free kick counts and prior opportunity, deliberate rushed behinds and a tighter interpretation of deliberate out of bounds. The question is are the media questioning the interpretation of the rule because it was wrong or because they simply disagree with it? It was great to see field umpire Brett Rosebury back for his first game in 2017. He took charge of the Richmond v WCE with Ray Chamberlain and Andrew Stephens. What a day at the G! The game started in brilliant sunshine and warmth but finished in showers and a strong cold wind. Even our Fiona McBurney participant, Julia Tieppo wasn’t going back onto the ground at three quarter time. New rookie goal umpire, Sam Hunter sat on the bench for his first game when Fremantle played the Western Bulldogs. Sam was looking forward to the opportunity to learn from experienced goal umpires, Brett Rogers and Luke Edwards. Brett umpired his 100th game in round 2 making him the third most experienced goal umpire to come from WA after Dale Edwick and Andrew Curtis. While we are talking about newly listed umpires standing up to be counted, spare a thought for new field umpire, Nathan Williamson. He was put into the clash of the round, the showdown in Adelaide in his third AFL game. Until Saturday night Nathan had never been to the ground. When opportunity knocks grab the chance with both hands because Nathan did. NSW based boundary umpire Michael Baker walked out in his third game ever in the Friday night blockbuster Sydney v Collingwood. “I have never heard noise like it,” was all Michael could say. Most of our injured umpires are back and putting up their hands for selection. Troy Pannell umpired his first game since Rd 14 2016 last weekend after recovering from a broken hand and a grade three hamstring strain. 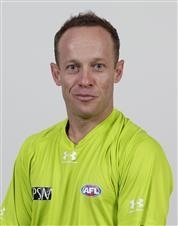 Brent Wallace (calf) has been umpiring in the VFL as has Hayden Gavine (foot). 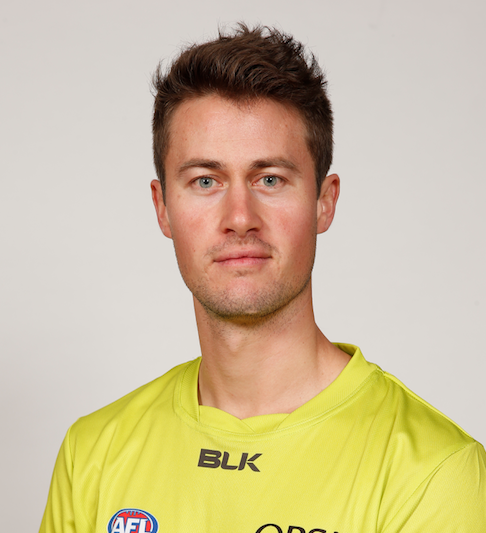 Boundary umpires Drew Kowalski (tendonitis) Adam Coote (Achilles), Ryan Kukura (calf) continue to recover from pre season surgery and injuries, Ian Burrows is still recovering from appendicitis and should be available for selection soon. Josh Mather (ankle) was back in this round for his first game of the season also.